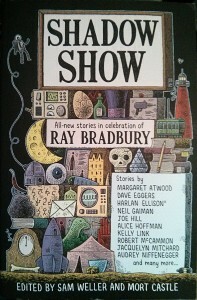 Shadow Show, edited by Sam Weller and Mort Castle, describes itself as “All-new stories in celebration of Ray Bradbury”. I’ve been a fan of Bradbury’s fiction most of my life. Friends from my high school days may remember me sitting under the bleachers during Pep Rallies reading “R is for Rocket” or wandering the hallways with a copy of “Fahrenheit 451”. I most liked his early work; stories like Frost and Fire or The City. They blended conventional science fiction with Bradbury’s unique style which approached magical realism. I felt his later writing lost a lot by abandoning the science fiction aspect and focusing exclusively on the magical realism. In any case, I heard about this book and imagined it might contain Bradbury-like stories that recaptured the feel of his early work. Alas, this is not the case. For the most part, the stories in the book aren’t really at all like Bradbury stories. At least, I’d never confuse any of them with the real thing. Most had supernatural or horror themes and lacked the connection to science fiction. They’re simply from authors who were, in one way or another, inspired by Bradbury. They’re not bad stories. Some are enjoyable and may appeal to Bradbury fans, if only to find out how other writers were inspired by him. There were a few exceptions, however; stories that are intended to provoke memories of Bradbury or his stories in one way or another. The best of these, at least for me, was Children of the Bedtime Machine by Robert McCammon. This story made the book worthwhile for me and was a real celebration of Bradbury in multiple ways. First, it was a story I could imagine Bradbury writing; second, it combined science fiction with a Bradburyesque magical realism, and lastly, Bradbury’s writing actually plays a part in the story’s plot. It’s the story of a woman living in a post-apocalyptic wasteland; the result of climate change and global war. There’s little plant or animal life left, and little hope for the future. The woman’s only joy in life is a trunk full of old books that she reads to herself. During a visit to a trading post in a nearby town, she’s given a useless machine from the dead past. The combination of a Ray Bradbury book and a machine designed for insomniacs leads to a new hope for a dying world. If you can pick up the book inexpensively, it’s worth it just for that one story. Or perhaps you’ll enjoy the other stories more than I did. Authors include Harlan Ellison, Margaret Atwood, Neil Gaiman, Joe Hill, Alice Hoffman, Kelly Link, and others.